This is an adaptation of a recipe given to me by Stéphane Bureau, the chef at the Clos d'Amboise in the Loire Valley. Cure 500 g of salmon overnight (or longer -- up to 4 days is fine) in a mixture of sugar, salt, dill weed and lemon juice (recipe here). Rinse the cure off, dry the salmon and remove the skin. Dice the salmon flesh and blend with a tablespoon of lemon juice, 500 ml thick cream, 250 g cream cheese, salt and pepper. 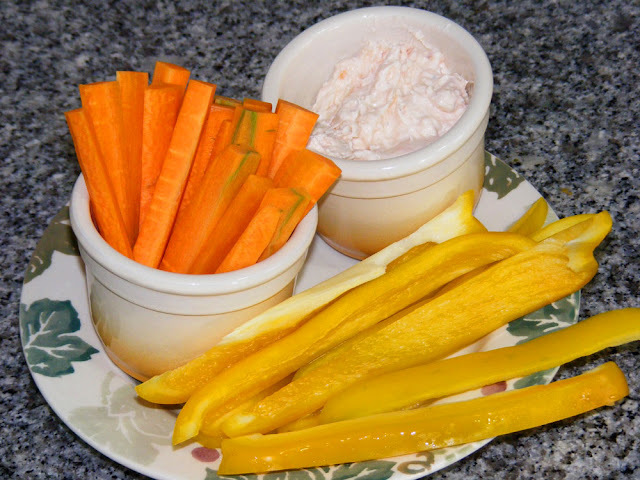 Serve as a dip, with batons of carrot, sweet pepper, kohlrabi, cucumber and celery. On peut trouver la recette en version français ici.